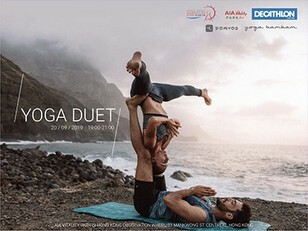 Join Decathlon and Yoga Bam Bam for this free yoga session! Together we go further and higher! Acro yoga is like playing a trust game, communication and patience are keys to success, just like maintaining a relationship. Join it with your friends to experience acro yoga with Melanie and her yoga BamBam team, enjoy the fun of Yoga! Join as a member of Decathlon and enjoy more sports fun!